The Edit Document Text tool is used for manipulating text in Adobe Acrobat CS6. This can include changing actual text characters or the appearance of text. You can change cat to read dog, or you can change black text to blue, or you can even change the Helvetica font to the Times font. When you change a PDF file, the original source document isn’t modified. Choose the Edit Document Text tool, click within the text that you want to change to obtain an insertion point, and then start typing the new text. Click with the Edit Document tool in your text and press the Backspace or Delete key to delete text. With the Edit Document tool, drag to highlight text and enter new text to replace the highlighted text. When changing text — whether you’re adding or deleting — Acrobat tries to use the font that was specified in the original document. Sometimes, this font is built into the PDF file, which means that it’s embedded in the file. Warning! Since the original font is not available, a substituted font for editing is used. Any changes to the text of the original font will place a new font dependency upon the document. Fortunately, you can change the font if you need to edit the text. However, when you change the font, the text may not retain the same appearance as the original document. In some instances, you may not have the exact same font on your computer as the font used in the PDF document, but you may have a similar font you can use without causing a noticeable change — most people won’t notice the difference between Helvetica and Arial or between Times and Times New Roman. Fonts with the same name but from different font designers often look very similar. For example, Adobe Garamond looks similar to ITC Garamond, even though they’re two different fonts. With the Edit Document Text tool, drag over the text you want to select. You may see a Loading System Fonts message followed by another Loading Document Fonts message. Depending on the number of fonts installed on your system, it may take a while for this message to disappear. Right-click (Windows) or Control-click (Mac) the highlighted text and choose Properties from the contextual menu. The Edit Document Properties dialog box appears. 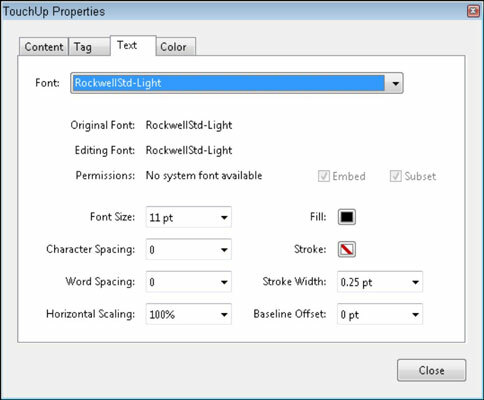 In the Text tab, choose the typeface you want to use from the Font drop-down list and make any other changes you want. In this dialog box, you can also change the size by selecting or typing a number into the Font Size drop-down list. In addition, you can modify the color by clicking the Fill color swatch. When you’re satisfied with your changes, click the Close button to apply your changes to the selected text.